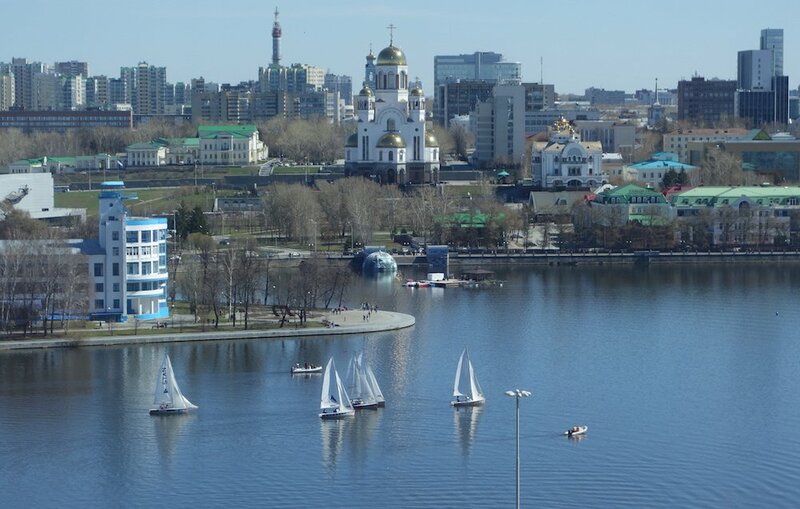 At the centre of Yekaterinburg, the “capital of the Urals”, is an embanked expanse of water, usually translated into English as the “City Pond”, though “Lake” captures its scale rather better. 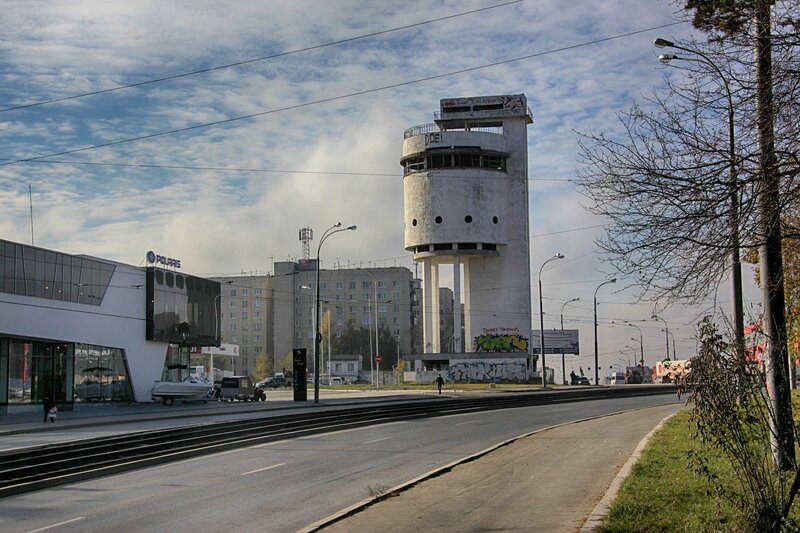 It’s the heart of this industrial metropolis, an unusually compact city by Russian standards. Yekaterinburg, founded in the 18th century as part of the Russian colonisation of the Urals, lacks any classical or axial grandiosity. It has instead a rough and lively juxtaposition of styles thrown together unpretentiously. There are towering red brick mills from the years immediately before 1917; there are classical palazzos; there is a high-rise Central Business District; and there is the Boris Yeltsin Centre. An unfinished TV tower and a shiny golden-domed church look out over the scene. On a warm day in May, this is one of the loveliest urban spaces in Russia, both calm and lively. In the last year, this “pond” has been the subject of popular protest, one where architectural style has led to the kind of contestation that isn’t meant to happen in contemporary Russia. Architecturally, the most interesting part of the pond is the peninsula occupied by the Dynamo Stadium and the smooth streamlines of the Dynamo Club, an attractive Constructivist ensemble set among trees. This is the stylistic antipode of the current proposal from the city’s oligarchs and authorities for a new church to be built on an artificial island in the heart of the pond. The project would destroy most of what is worthwhile about the space — its placidity, openness and architectural heterogeneity. The sponsors’ stylistic model is Moscow’s St Basil’s – as if to stamp a traditional Russian identity upon a deeply modern place. 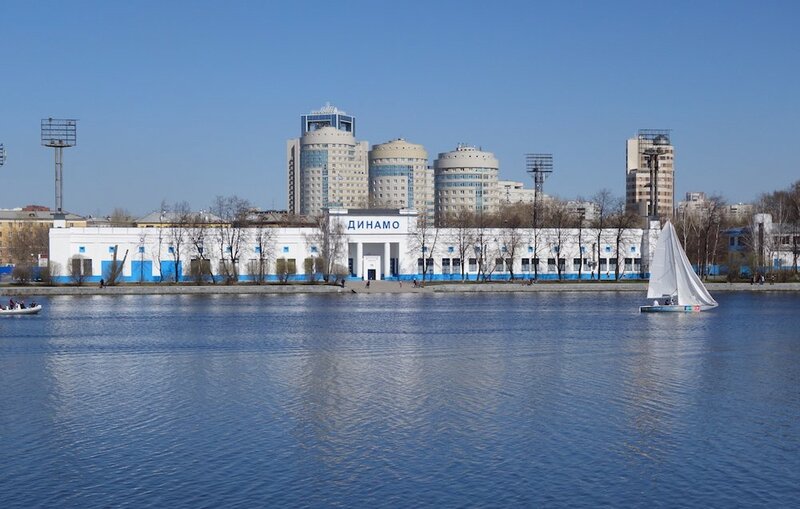 Many of those involved in the “defence of the Pond” have been involved with a parallel project, to rebrand Yekaterinburg as a capital of Constructivism. To choose this city as the place to commemorate the most strongly modern, revolutionary period of the Soviet Union would once have been controversial. The city is perhaps best known outside Russia for being the place where Tsar Nicholas II and his family were killed, in the basement of a merchant’s palazzo, at the start of the Civil War. The Church of All Saints Resplendent in the Russian Land now stands in its place — the palazzo was demolished in the 1970s by the order of the region’s governor, one Boris Yeltsin. 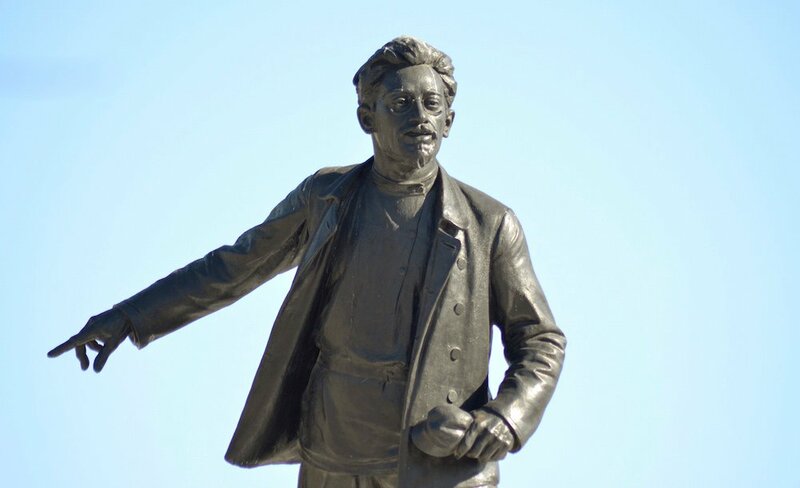 The city named after Catherine I was renamed Sverdlovsk in 1924, after Yakov Sverdlov, a prominent Bolshevik who died young in 1919, and who had a role in ordering the execution of the Romanovs. 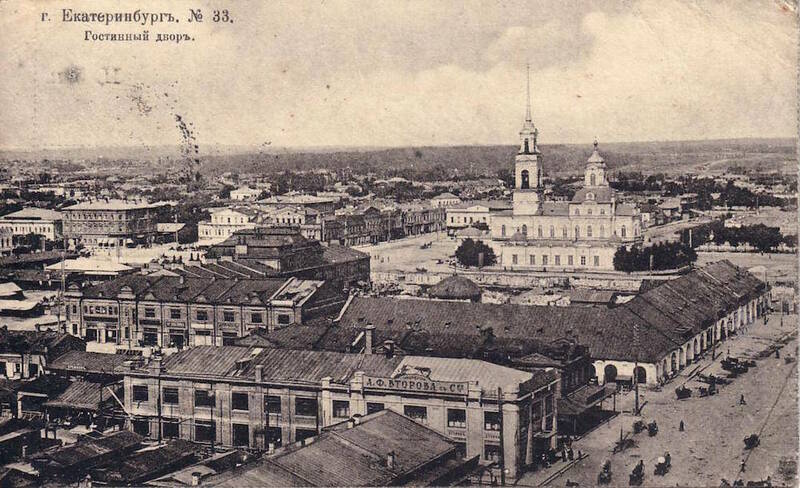 In a typical post-1991 rhetorical compromise, the city was renamed Yekaterinburg, while the region continues to be known as the Sverdlovsk Oblast. 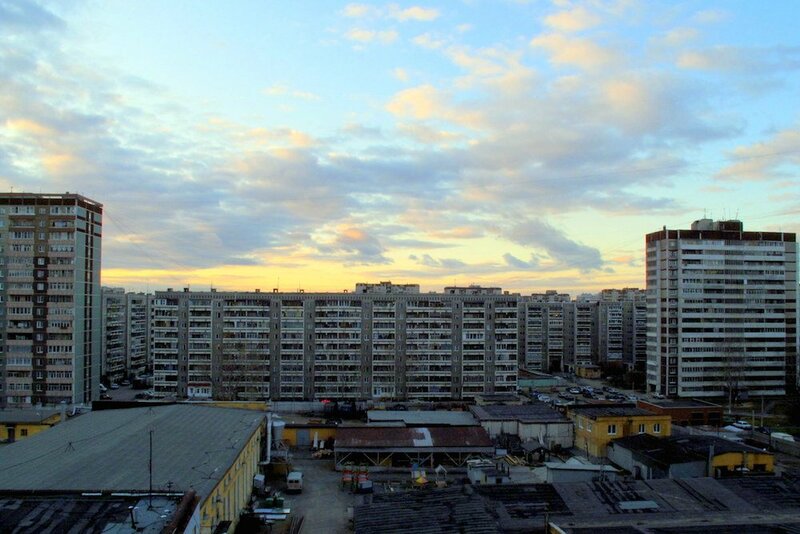 Elsewhere, the city of Sverdlov and the city of Yeltsin can be found in roughly equal evidence — a Constructivist industrial settlement, full of experiments in communist living, later becoming the power base of the politician who dismantled the socialist system. Already an industrial town, Sverdlovsk had its big bang between 1928 and 1932, during Stalin’s First Five-Year Plan, which entailed a massive expansion of Urals industry, exploiting the mineral deposits in the area. New towns like Magnitogorsk and existing centres like Chelyabinsk expanded around the mountains which are the alleged geographical border between Asia and Europe. There are a few peculiar little experiments which try to make something of this geographical significance — the Sevyastanov House, built in 1866, is the city’s most interesting pre-revolutionary building, its bright colours, pointed arches and florid swags a piquant mix of Russian baroque and Turkic Orientalism. Otherwise, this is a modern city, and unsentimental about it. 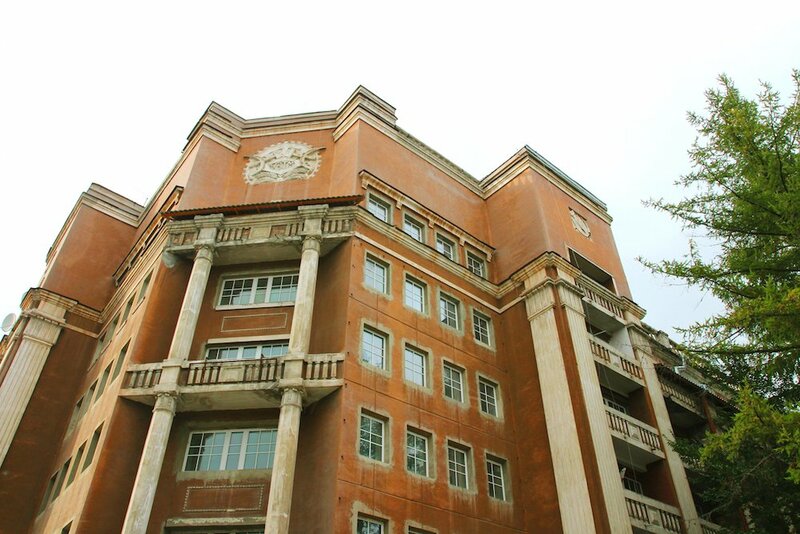 Most Constructivist buildings in the USSR were built during the First Five-Year Plan, and Sverdlovsk was no exception: the main distinction here is the sheer quantity, and the state of preservation. The city was transformed through two things: first, what was referred to as the “Big Sverdlovsk” Plan, which turned the city centre into a showcase for avant-garde housing and office complexes; second, the development of a new town on the outskirts, Uralmash, which still has a distinct feel, and is considered by locals to be a place apart. Big Sverdlovsk is strung out across the two parallel main streets, Malysheva and Lenina; it is effectively a series of segregated communities, built for particular professions, still referred to by their original names: Builders’ Village for construction workers; Justice Village for lawyers and the legal profession; one for Uraloblsovnarkhoz, the administration of state farms; another for Government Workers; and the most famous of them, the Chekists’ Village, for employees of the secret police and their families, designed by Ivan Antonov and Veniamin Sokolov in 1929. These vary in coherence, completeness, quality and in the degree to which they’re still distinct and gated. The Chekists’ Village has long since had its fences removed, although the gateposts still stand. It is entered through Lenina past the monumental Hotel Iset, currently derelict, a ten-storey curved block with plate-glass shops on the ground floor; inside the complex, tree-lined pedestrian streets define elegant, if severely dilapidated tenements that you could imagine in Glasgow or Brooklyn, with grand bay windows, rendered in a weathered soft red. The interiors — I was lucky enough to be invited for a drink in one of the flats — are not huge, but are well-designed and full of light. This impressive showcase in socialist living was, it should not be forgotten, grace and favour for the enforcers of the early Stalinist system, then engaged, among other things, in confiscating grain from starving peasants and condemning kulaks and Trotskyists to concentration camps. Under Khrushchev, the Village was opened up to non-Chekists, and is not owned or used today by the KGB’s successor, the FSB, though they do operate a clinic here, and urban myths abound of secret passageways and dungeons. Just on the other side of Lenina, the Builders’ Village is less impressive, though still decent, with white-walled blocks of flats, the same clinics, gardens and schools, and a Club, an asymmetrical, lightweight composition of separated cubic and curved volume. The administration of collective farms, on the other hand, received something truly avant-garde in their complex of flats and dormitories on Malysheva. 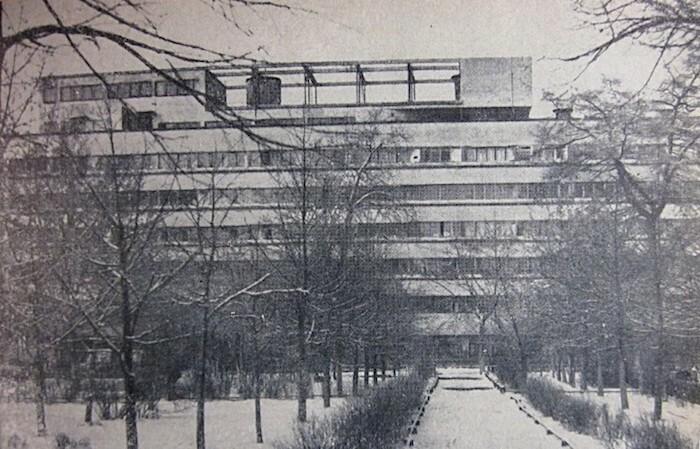 Designed by Moisei Ginzburg, it is a forgotten cousin of his Narkomfin building in Moscow, a “transitional” collective house including flats linked by walkways and a small park to communal facilities. It is still gated, although many of its original features — the open ground floor held up on pilotis, a roof garden – have been removed. 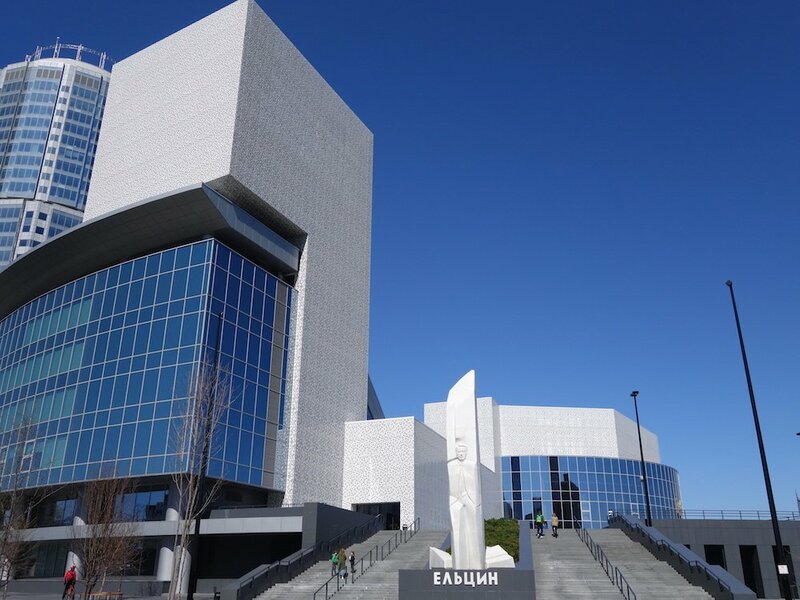 It shares Narkomfin’s laconic, unfussy proportions, but lacks the high tragedy of its Moscow counterpart — rather than rotting to picturesque pieces, it is merely nibbled around the edges by the kipple of Russian capitalism. 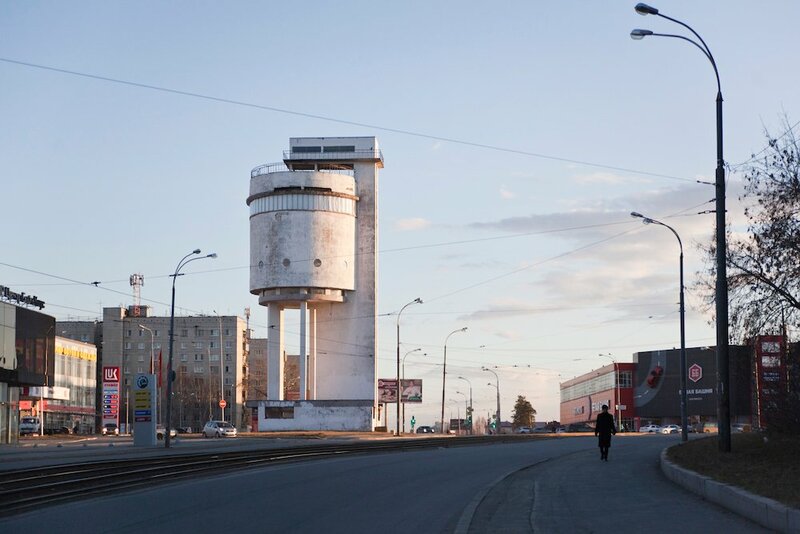 The scholar of Constructivism Mikhail Ilchenko, who was raised in Uralmash, has described the approach taken by campaigners for avant-garde architecture in the city as being a reminder of the original utopian blueprint. He argues that rather than making it part of heritage culture or concentrating on raising support from the international modernist preservation movement, local activists have produced works — posters, pamphlets — which emphasise not the buildings’ current state, but the original drawings and photographs that show just how beautiful and confident these structures were before history took its toll. Not the actual USSR people remember, but what it once dreamed of becoming. I’m sceptical of this as social history, but as activism, it’s a very smart approach, stressing not the mundane reality of lived-in places, but something unfamiliar — dreams of collective living, futuristic buildings whose materials will never wear, placed in abstract, empty space. A fair few miles from the city centre in an otherwise tightly defined city, Uralmash was effectively cut off until Yekaterinburg’s short, infrequent metro was built in the 1970s (like many late Soviet metros, its beauty is in inverse correlation to its utility). Its centre is a vast and useless square with some rather fascinating buildings. These range from the Constructivist lines of the House of Culture, the faded pomp of the derelict, early Stalinist-Classical Hotel Madrid, and the administrative offices of the Uralmash (Ural Machine-Building Plant) itself. This is a stark modernist building, caught exactly between avant-garde dream and Fordist reality. 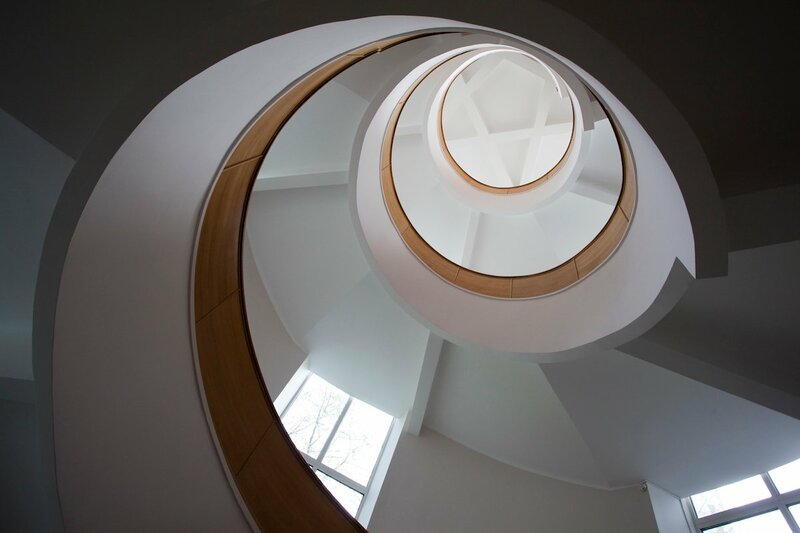 The White Tower is a startling work of monumental architecture that dominates the new town. Its function as a water tower may be straightforward, but Moisei Reischer’s design is utterly extraordinary, a circular panopticon on stilts. Its alien nature is compromised a little by the malls and car showrooms around, but when you look at it dead-on towards the forest, you can see it as originally seen, as Ilchenko and the Constructivist activists would want it — a pioneer, in virgin territory, fearless. 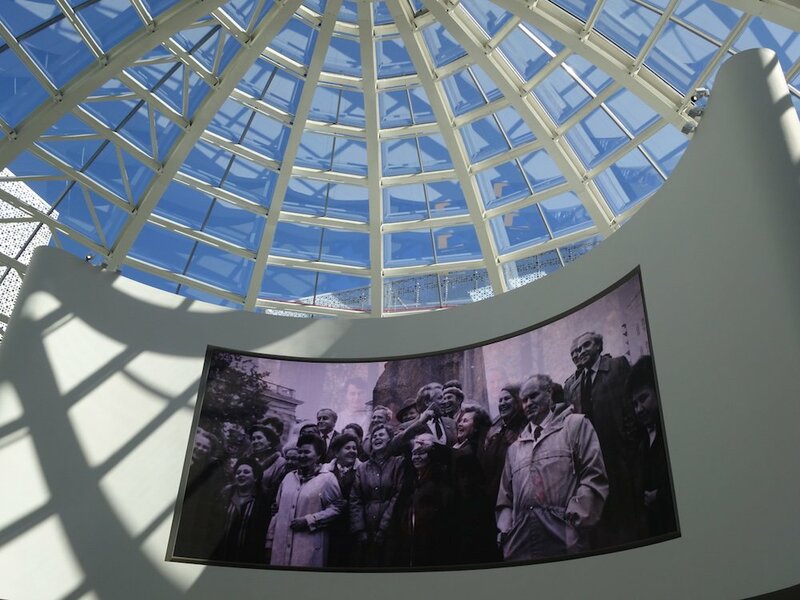 It is run today by volunteers, who show films and host exhibitions in the circular overlook room, with only minimal help from the city or the government. This is one of the great edifices of 20th century Russia, but the residential Uralmash around it doesn’t inspire the same awe. Its blocks of flats are flattered by a wild density of trees, untamed and twisting all over the pocket parks and drained fountains. The early blocks, with their spacious flats, were popular among organised crime kingpins in the 1990s. The post-Soviet descent of Uralmash and Yekaterinburg into violence, via warring consortia of managers from the “Red bourgeoisie” and formerly marginalised working-class gangsters, can be enjoyed, if you’re so inclined, at the city’s notorious “mafia cemeteries”. Here, shellsuits and ‘90s cars are preserved forever on headstones of granite and marble. Boris Yeltsin cannot have imagined that this would represent the social base of his policies when he came to prominence here in the 1970s. His ambitions for the city can be seen in the one-line metro, the unfinished TV Tower that is visible all over the city and the high-rise office block he commissioned, its thin mullions of stone like a Sovietised World Trade Centre. It is now joined by a half-empty series of hotels, luxury flats and offices, shoved into the open spaces around wooden houses, some preserved for historical significance — including one that has competing plaques immortalising both the Red and White Armies. This “CBD” is lit up with pulses of neon at night to give it a sense of activity it lacks by day. In front of this is the Boris Yeltsin Presidential Centre. Designed by the American architects Ralph Appelbaum Associates — why try and emulate when you can import, a lesson Yeltsin applied to the Russian economy, with catastrophic results — the Yeltsin Centre is a decent building, curved volumes with multiple entrances, a cafe, some shops and an amusing neo-Soviet statue of Yeltsin. The programme of talks, library and art gallery do in fact fulfil the aim of the building, which is, I’m told, to create a kind of anti-Putin museum without actually doing so, proceeding by implication through open praise for things such as representative democracy, freedom of press and freedom of assembly. The main museum is, however, the most nakedly, grossly propagandistic space I have seen anywhere in post-Soviet Russia. Aside from the question of presenting democracy as Yeltsin’s personal gift, hugely controversial matters that laid the foundations for today’s “managed democracy” — the deepest economic depression any country has ever suffered in peacetime, the invasion of Chechnya, the bombardment of Parliament in 1993, the rigged presidential elections of 1996 – are either batted away or blamed on the Communists. The real story is told inadvertently, in the footage, where Yeltsin ages quickly, from the quick-witted operator of the late ‘80s — seen in holographic form delivering his epochal 1987 speech to the Politburo, the first time anyone at the top had rebelled so openly since Trotsky – into the drunken, hapless slug he was by 1996. I wonder what Yeltsin would have thought about the fact that just outside, on that lovely riverside embankment, people are trying to apply those 1980s ideas about civil society and public protest to the preservation of socialist monuments he did his utmost to crush into dirt.